This entry was posted in Blog, Chickens and tagged bald eagle, Bantam rooster, chickens, free range poultry, NaBloPoMo, predator, small farm. Bookmark the permalink. Oh poor Fritz! Glad he showed up – do combs grow back? It doesn’t sound like it… I think he’s always going to look a bit odd (even odder than he did before…). Sounds like Fritz had some kind of nasty encounter. I’m glad he is back. He might be a little reluctant to go back out in the future. Your list of chores each day is long. What do you do when you have to be away? Or, do you never get away? It is a long chore list and with livestock, you just never know what they might throw at you. It is really hard to get away – even local events are tricky if they happen at the wrong time of day. I have a couple of farm sitters who will come and stay here if I need to be away for a few days at a time, but that can be tricky if they aren’t available. Spontaneous weekend getaways don’t happen too often! I challenge you to write the story anyway, from Fritzy’s point of view and in Fritzy’s voice. He knows what happened, even if you don’t. Oh, what a relief! Hate it when they get your favourite 😦 Hope he heals well and stays safe. Poor baby! So glad there was a happy ending! Ah, the adventures of being a chicken. We have a crippled Ameraucana named Forrest to keeps to herself in the coop. But then there was this one day when she hobbled out and was attacked by a hawk. I figured she was gone, but nope. She’s still with us, despite being effectively scalped. The resilience of chickens is amazing! They constantly surprise me! Good to hear Forrest is still around! Lovely story. So glad it had a happy ending! Have you seen the eagle webcam from Decorah in NE Iowa? They have been tending to the nest off and on preparing to lay eggs in February. Follow the link to see a live view. There is a 30 sec ad at first. Here are a few recent visits by them posted to YouTube. This is so cool!!!!!! Thanks for posting the link… I love the way they are tidying up any stray sticks that happen to be messing up the nest. How amazing to be able to watch them throughout the season. All you need is a lamb and a lion and I think you’d have heaven! Are those Scottish deerhounds? They look like one of the big shaggy sight hounds … which I totally love. Hounds and terriers, separately and together! Wonderful site. I’m so glad I found you! The dogs are whippet X standard poodles… better known as lurchers in England. They are the coolest dogs ever… They are blisteringly fast outside, but mellow as can be in the house (except when unexpected visitors show up… then, some bouncing off the couch/walls/bed/visitor has been known to occur). They don’t shed and don’t generally bark much and they are the kind of dog where you can just leave a full bowl of food out and they’ll modestly snack throughout the day without ever over-indulging. I’m very glad you found me, too – I’ve been enjoying reading your posts as well. I often sneak in quick blog reads while waiting for water buckets to fill and that sort of thing and because that often happens when I only have my phone, for some reason I’m often not able to comment even when I’m using the WP app… very frustrating as later in the day when I’m back at a computer I can’t always remember all the various posts I was hoping to go back to and say something! Well, glad you are enjoying my place too. I couldn’t tell how big the dogs are but I imagine, given the breeding, they are really fast and agile too. I’m a little slow to try to manage really fast dogs. Even my little terriers can out maneuver me these days. How humiliating … but funny. I always wanted a farm … but not the labor and uncertainty that goes with it. How you manage all that work and a blog too I can’t even imagine. Do you sleep? Bet you don’t have time to be bored. Ever! I just love the terrier personalities! So entertaining! As for the speed of mine, unless they are in hot pursuit of a rabbit, they are excellent about coming when I whistle, which is a good thing because chasing them down would be impossible. As for boredom… you have that right. The closest I come to being still is when I sit, puzzled, staring at my to-do list wondering which end to start at! Thank goodness for mobile devices, quick naps, and the flexibility to be able to work late and squeeze in bits and pieces of writing/blogging time between back-breaking labour sessions… Somehow, usually, it all comes together. And being young enough to keep up that kind of schedule! Be careful out there. 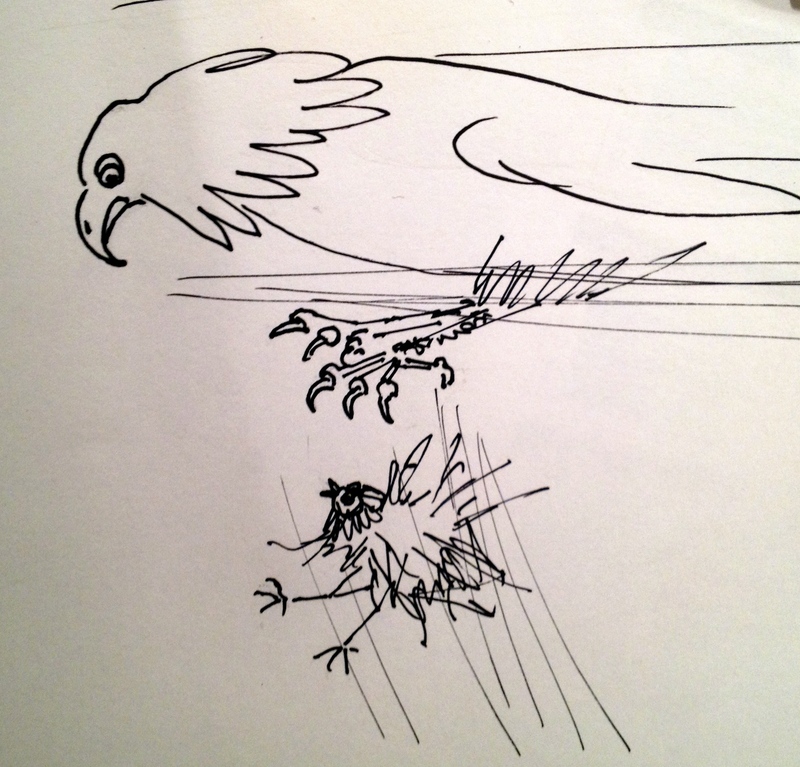 A hawk scooped UUP my grandfather’s toy poodle when he let him outside to relive himself. Flew away with the poor boy never to be seen again. Happy your too made it back home safely.